A stylish, provocative look at the tremendous-often invisible-success of Canada’s greatest brands. 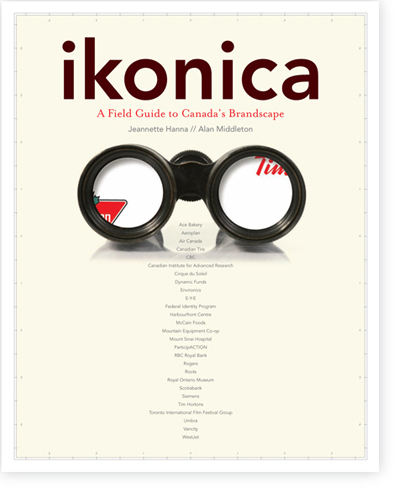 Ikonica is the first exploration of Canada’s rich and unique brand heritage. Authors Jeannette Hanna and Alan Middleton shed light on the evolution of our country’s best-known brands, from the Hudson’s Bay Company to Blackberry. This visually stunning tour of Canada’s branding environment highlights the prime movers, the triumphs and the failures. Both Hanna and Middleton draw on years of experience as brand strategists to offer an inside look at the major players in Canadian branding, from global success stories like the Four Seasons Hotels to domestic upstarts like WestJet. The heart of the book is more than thirty interviews with a “who’s who” of major business and cultural figures including Paul House (Tim Hortons), Robert Milton (Air Canada), Fred Schaeffer (McCain) and William Thorsell (Royal Ontario Museum). The authors’ provocative analysis shows what it takes for Canadian brands to punch above their weight in the global marketplace.